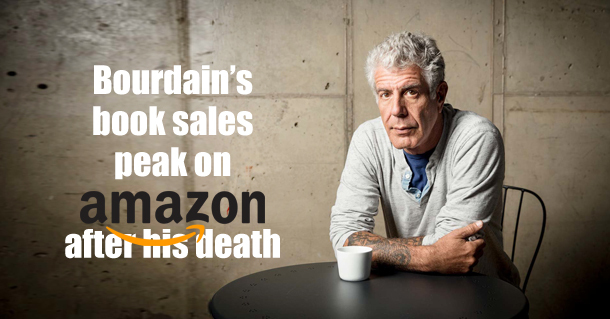 Six of the top selling books on Amazon are penned by the celebrity chef Anthony Bourdain, who was found dead in a French Hotel on Friday, June 8. These bestselling titles include Kitchen Confidential, the highly-acclaimed memoir from 2000 which actually changed his fate from a little known chef to a celebrity overnight. The other titles are Medium Raw (No. 4), Appetites: A Cookbook (No. 5), another edition of Kitchen Confidential (No. 7), A Cook’s Tour (No. 8) and Les Halles Cookbook (No. 10). Another Bourdain book, Nasty Bits, is at No. 29. As an author, Bourdain worked on several culinary titles. Before becoming a chef, Bourdain was an essayist and has also written some crime novels. Bourdain also hosted several food-related TV shows, including CNN’s Anthony Bourdain’s Parts Unknown, which he was filming in France at the time of his death.